David Boardman is Executive Editor and Senior Vice President of The Seattle Times with oversight and responsibility for the news department and seattletimes.com. 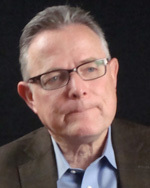 Under his leadership, The Times won the 2010 Pulitzer Prize for breaking news, presented for print and online coverage of the assassination of four police officers. Boardman is secretary of the Board of Directors of the American Society of News Editors and a past president of Investigative Reporters and Editors. He is a graduate of the Medill School of Journalism at Northwestern University and has a graduate degree from the University of Washington. David Boardman, executive editor, The Seattle Times, says for the first part of its existence, The Times website was “the newspaper online.” He says there was an intentional wall between the newspaper reporting staff and the website news staff. But about five years ago, Boardman says, “We started to pound holes in that wall.” Recently, The Times has further reorganized to create three organizational units – content creation, content curation, and community content with three news managers to oversee the merging of print news and all the new electronic platforms the newspaper employs. Watch this interview to learn the details. David Boardman, executive editor, The Seattle Times, says competitively The Times, in past years, had taken a more “second-day approach to news.” But now, leveraged by the Internet, it is emphasizing breaking news. This change was demonstrated in winning the 2010 Pulitzer Prize for breaking news coverage. In November 2009, when four Lakewood, Wash., police officers were gunned down, The Times responded quickly and “all the training we had done – all the discussions we had about handling sensitive material – worked,” says Boardman. David Boardman, executive editor, The Seattle Times, says students should not let “anyone dissuade you” about a career in journalism. “There will always be a demand and a need for a business around what we do,” says Boardman.